After Cambridge scholar Nathan Tobin discovers an ancient Aramaic letter, he finds himself thrown into an agonizing struggle against powerful forces committed to discrediting him. The Alexandria letter discloses surprising revelations about the lives of Jesus and John the Baptist, as well as shocking claims of duplicity of Paul of Tarsus, which threaten to turn long-held principles of Christianity on their heads. Bust as he races to verify the authenticity of the letter, he faces rejection by his fellow scholars and sinister opposition from within the Church that aims to stop him at any cost. The Alexandria letter represents the most important work Nathan has ever done, but it may also be the last. Dr. George Honig is Professor Emeritus at the University of Illinois College of Medicine. He received his MD degree from the University of Illinois and his PhD from George Washington University. In his professional career, he has been a clinical teacher, a children’s physician, a pediatric hematologist and oncologist, an academic and clinical administrator, and a biomedical scientist. He is the author of numerous medical and scientific publications. His longstanding interest in the intersection of history, religion, and the healing arts led to the creation of The Alexandria Letter. He lives in Chicago with his wife, Olga. I first off have to say that I love the look and feel of the book. It is very good quality which is hard to find these days. The cover looks as intriguing as the book actually is. 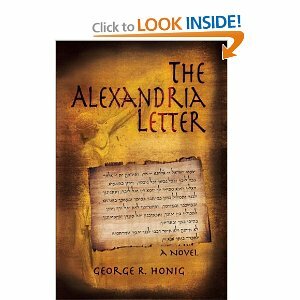 There are two parts of the book that are woven together- the present day and the actually Alexandria letter. The present day plot was fast paced and brilliant. I was very interested to find out what was going to happen with the main characters. There was betrayal, intrigue, and romance. The only bad thing about the present day plot is how it ended. I felt the ending was a little rushed and left me with a feelings of what just happened here. It felt cryptic. I would have rather it been more in depth and didn’t leave me with some questions. The Alexandria Letter was very different. It brought a new theory to who and what Jesus really was. For me as a devout Christian, I had a hard time getting through it. I found it very interesting and was very engrossed in it. It is just with my beliefs I had a hard time reading it and remembering it is just a piece of fiction. The letter really would undermine all of what Christianity is and stands for; thankfully this is just a fiction. I don’t want to scare you away from the novel because it is a great fast paced thriller with religious and historical overtones. I have heard that it is along the lines of The DaVinci Code but I never read that book so I cannot tell you whether it is true or not.